We were very late to leave on Thursday morning. We woke up late, because we'd both been sleep-deprived in the days before our trip. (Our room did a fabulous job of keeping out the light; we discovered later that the curtains were lined with aluminum foil.) And when we woke, rain was pelting down, and the clatter of the rain made it seem extra cozy inside. 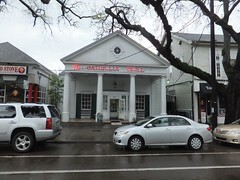 So we didn't leave for Camellia Grill until very late in the morning. I have racked my brain trying to remember why I asked the waiter about the muffuletta on the menu. 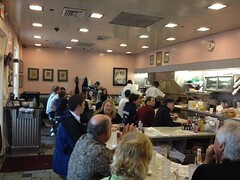 I had mostly resolved to have the red beans and rice, which I'd found delightful before. And I wouldn't have called myself a muffuletta fan; I had had the muffuletta at Central Grocery (where the muffuletta originated) in 2011, and I considered it good but not great. But some faint memory of Chris Ayers saying that he had heard someone speaking well of Camellia Grill's muffuletta triggered a stray neuron, and I asked the waiter about it. And he said that it was a great muffuletta, and then I felt awkward about the thought of choosing something else after such a glowing recommendation. So I ordered the muffuletta—and I'm very glad that I did. Though the Central Grocery's muffuletta was just a good sandwich, the Camellia Grill's muffuletta was one of the greatest sandwiches I've ever had. There were differences from the original muffuletta; this used corned beef instead of the Italian meats, and used a bread that's not the traditional Sicilian muffuletta bread. The most significant difference, though: this was served hot. This did make it a sprawling, messy sandwich that had to be cantilevered with a fork to bring it to mouth, but the taste was sublime. The grilling made all the flavors blossom, especially the garlicky olive salad, so that the effect was like a brass band playing in my mouth. My mouth is watering now just at the memory. 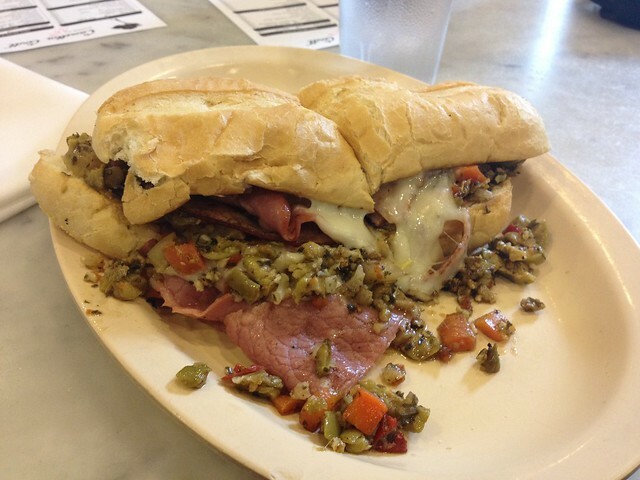 The waiter said that the city's best muffuletta is found at Nor-Joe Imports. I did not get a chance to test this claim. 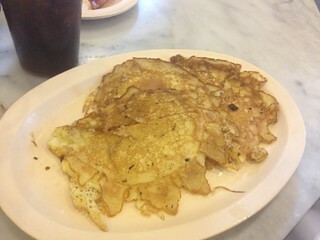 Lori ordered the pancakes, because she's found them perfect on three previous visits. Unfortunately, this visit's pancakes were only very good. 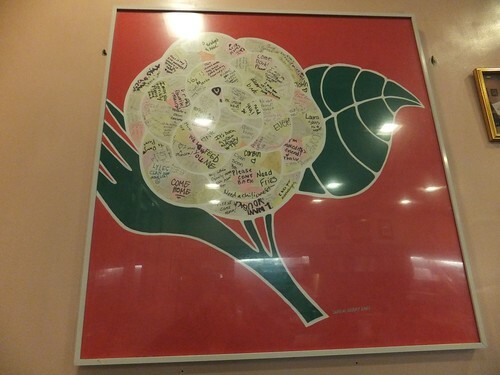 On this visit, the Camellia Grill had a whole lot of banter and sass flying back and forth among the staff, which was really fun to listen to while we ate. One last picture of note: this iconic camellia is made from a few of the hundreds of Post-It notes that were posted on the walls imploring them to return after Hurricane Katrina.